These three treasures in the picture (left to right) are: Red Racer IPA, RR White Ale, and RR Extra Special Bitter. 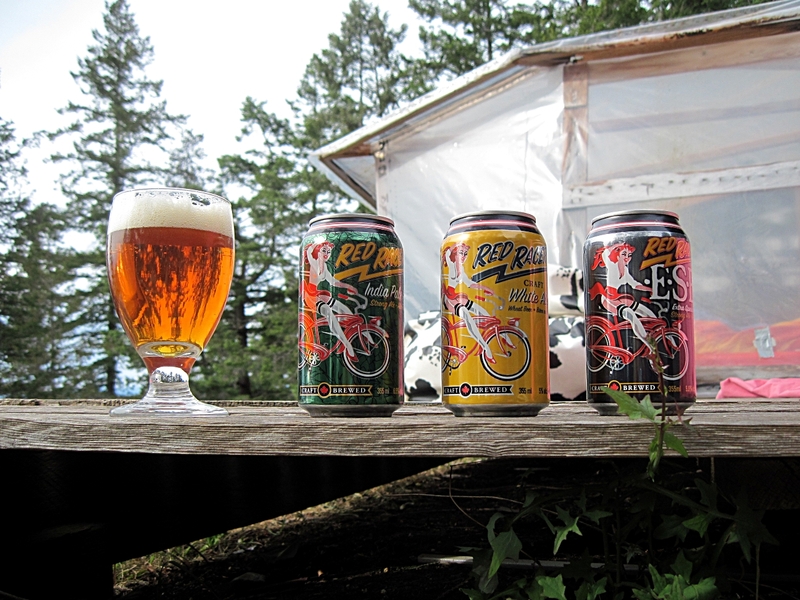 I happen to be residing in BC right now and Red Racer is readily available. It even seems to be a highly acclaimed, local favourite. Admittedly I’m in Powell River, BC, not Surrey where The Red Racer Brewery is located, so, it’s still not as local as can be. There is a brewery in the small town of Powell River and they do make a delicious IPA and a wheat beer, but I’ve gotta say, it’s pretty hard to beat a Red Racer. I did find myself going back to the RR shelf at the liquor store again and again.. until recently I became over-stocked so much on home-brew that I can hardly justify buying beer at all. I completely agree with Rob’s review of the IPA. Never have I tasted such a citric, hoppy brew. It’s hard to believe that there isn’t actually any grapefruit in there! This is a very refreshing, delicious beer that can be enjoyed over and over again. At about $15 /six-pack it is more expensive than most six-packs of cans, but well worth it for the quality in my opinion. The White Ale (wheat beer) and the ESB are also tasty treats. They both definitely have elements that are reminiscent of the IPA. They are not quite as hoppy of course, but there is a certain flavour that transcends them all. I would imagine they are using some of the same variety of hops to achieve a signature taste across their entire selection of beers. The White and the ESB taste pretty much as you would expect (or at least as I did). The White is light, crisp, cloudy and refreshing as wheat beers tend to be. The ESB is darker, not actually that bitter, kind of roasty and fruity. Both of these beers are worth checking out if you get a chance. They’re good but not irresistible like the IPA.